Arthurian scholar and writer Geoffrey Ashe points out (in ‘Mythology of the British Isles) that there are at least fifteen locations of the folk-belief, in one form or another, through Wales and up to Melrose in Scotland, for the resting place of King Arthur (not excluding, of course, Glastonbury Abbey). Throughout Britain there are caves, stones and supposed graves for this essential, historically shady, mythologically important King who may or may not have existed, yet holds such a grip on national consciousness. Bedd Arthur or Arthur’s Grave sits on top of the Preseli mountain ridge in Pembrokeshire. It consists of thirteen upright stones and has an oval configuration similar to the earliest model we have of Stonehenge. At one thousand feet above sea level it is quite remote and there is little consensus about its age. There is a barely visible bank and ditch. Various theories claim a link with Stonehenge, not only in design, but including speculation about nearby bluestones being taken from here to Wiltshire. There is an account of Bedd Arthur on the Clas Merdin website (Legendary History, Celtic Mythology and Matters Arthurian) by Edward Martin in 2014. In summation it appears to be Bronze Age, measuring 18metres x 7 metres, and was promoted in the modern era by Herbert Thomas in 1923. Arthur’s Stone, near the village of Dorstone, near Hay-on-Wye seems to be a more alive and affecting Arthur place with its 25 ton capstone but both sites are well worth visiting. 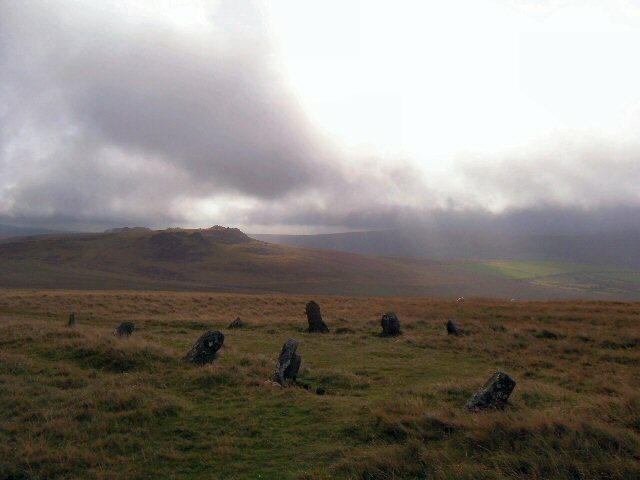 Location Access is via an ancient trackway with a gentle ridge walk from Carn Meini.